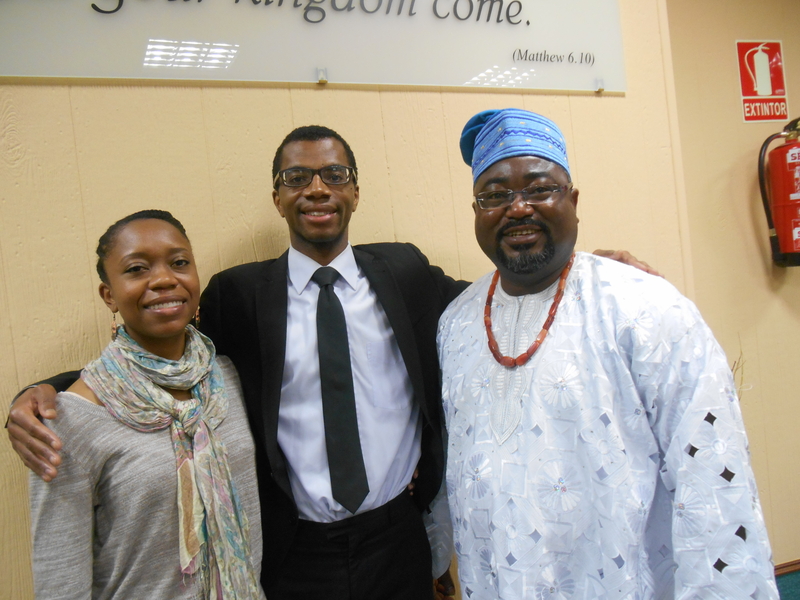 Sunda always brings out the best traditional outfits at the Kingdom Hall. Memorial season is upon us! As is spring-like weather! How can we take advantage of this? Well, we are modifying our service schedule slightly so that we will be able to have longer service days during the weekend. Saturday was the first day for us to try our new schedule. It involves starting at 9am (I know, what’s special about starting at 9am, right? but this is early in Spain) and finishing around 2pm or 3pm. Normally we take the metro to the service meeting which begins at 10:30am but with this new schedule we decided to do street witnessing along the river Nervion which takes us to the service meeting in about an hour. This is a very beautiful walkway along the river and we pass a churro stand along the way, which adds incentive for us to go out. 🙂 The walk also includes views of the Guggenheim Museum which are always enjoyable. Arriving at the service meeting we took the metro to work some territory in Getxo which is a city near the water. After service we decided to visit Alhondiga in Bilbao city. 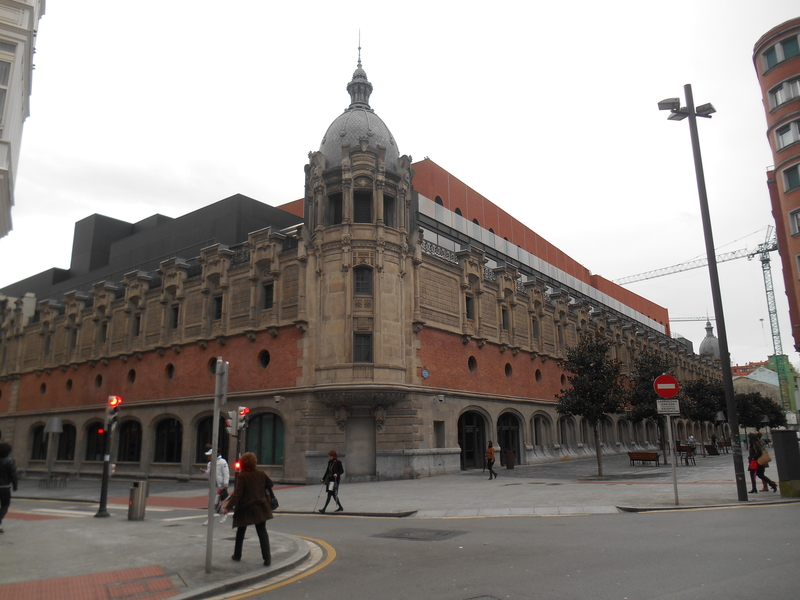 This is a five story center which includes restaurants, a library and a movie theater and a pool. The building was designed by a French architect and is quite impressive. The bottom floor is completely open and has a very futuristic and modern look to it. The next three floors house the cleanest and most modern library that we have ever seen. Imagine an Apple store…now multiply that by three stories and add books. That’s what this library is like. They even have an area where you can watch flat-screen TVs! There are tons of the latest Apple and PC computers on every floor for people to use. This library would be a great place to go to study or just spend some time reading or watching TV, since we don’t have one. There’s also free wifi. We will be back for sure, maybe to get some Spanish dvds or cookbooks. The Alhondiga center also has a pool on the fourth floor which links to a gym. 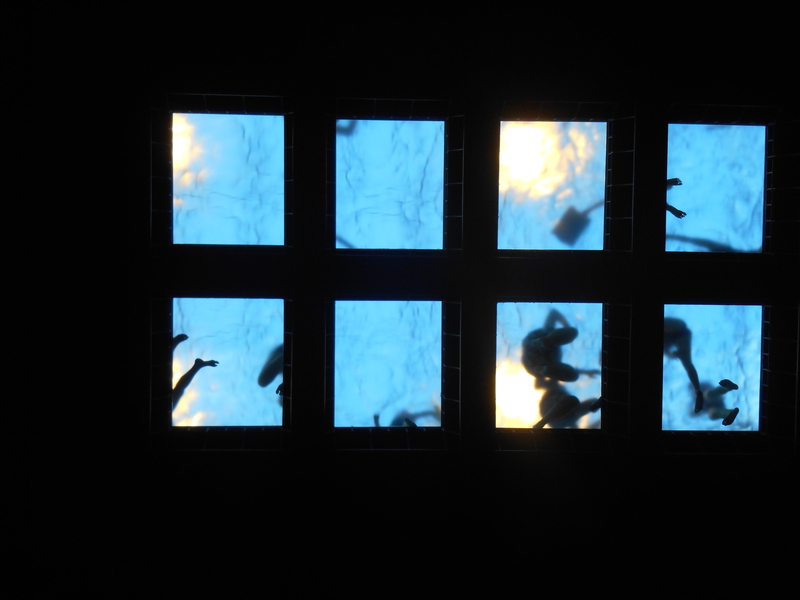 When you are walking on the first floor you can look up and see the people swimming in the pool because it’s a glass-bottomed pool. There’s also a rooftop terrace restaurant where you can take in the view of the street and have a drink. On Sunday after the meeting we had dinner with a couple in our hall named Roberto and Esther. They are a very nice couple and we enjoyed getting to know them better, we have a lot in common:) Esther made homemade pizza and arroz con leche for dessert. Overall the weekend was very relaxing and enjoyable. 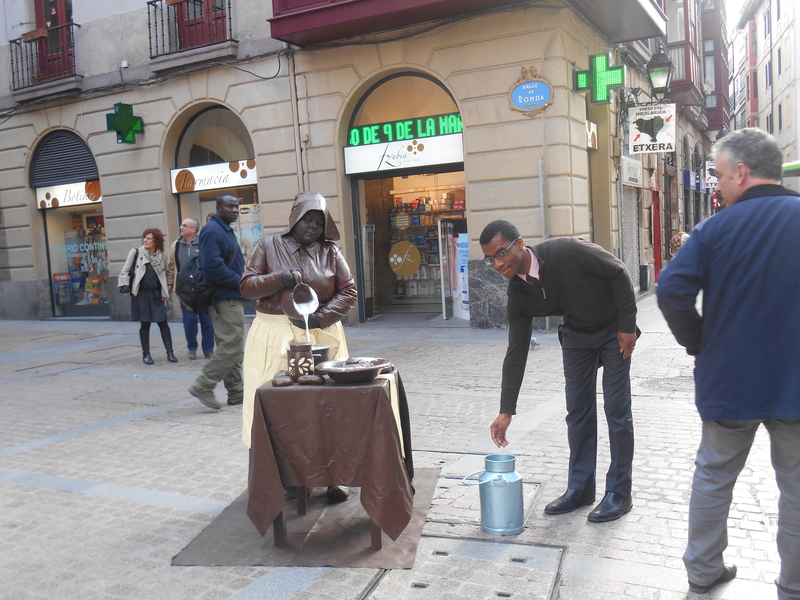 Antoine donating to a local street performer. The pool in Alhondinga Center as seen from the first floor. Sunday always brings out the best traditional outfits at the Kingdom Hall.